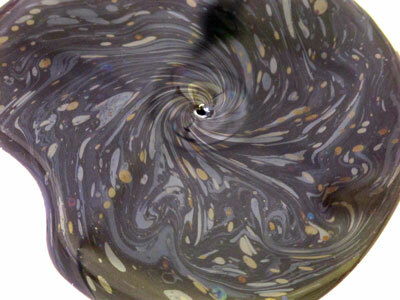 A seemingly incidental spillage reveals a spiralling vortex at its centre. The puddle appears to be constantly pulled into a void though it never reduces. Closer inspection reveals a microcosmos of complex behaviors. The perpetual puddle vortex draws in fluid and air, and re-circulates it back in to the puddle, so the puddle never disappears. Underneath the puddle is a vortex generating device, this does not simply spin the puddle; the liquid spirals down a hole, but magically the puddle never reduces. Over the day the puddle produces a continual array of ever changing patterns, in foam, or a thin layer of floating oil. The work changes according to temperature and moisture levels and light. Again the understanding of surface tension is essential to this work. The tabletop finish is highly hydrophobic, thus maintain the bead like edge of the puddle. The floor must be vibration free to avoid the puddle spilling off the table. The oils mixed in are a combination of petroleum and mineral oil. 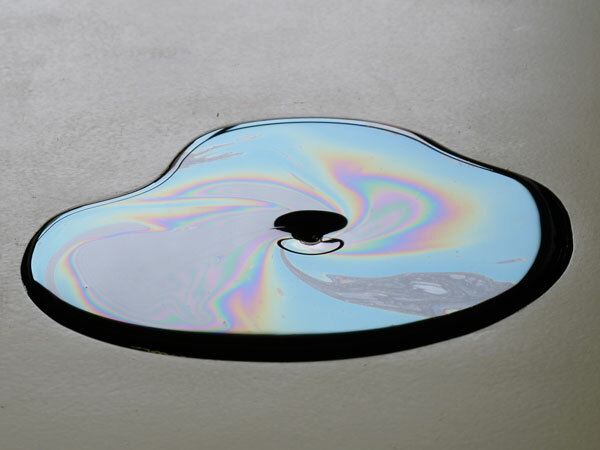 The colours are created though diffraction, according to the thickness of the oil, which depends on the speed of the flow in the puddle; so the colours change as the fluid accelerates towards the center of the vortex. Perpetual Puddle Vortex commissioned for Station Bristol 2001. Antony Hall is a multidisciplinary artist who works with science creating kinetic artworks, installations using sonic, mechanical, electronic or biological elements. ‘Tabletop Experiments’ is an umbrella for these projects as well as presenting a performance aspect in the form of science/art education workshops since 2001. Hall has worked extensively if the field of art and science [Sciart and Bioart], having spent 3 years resident in a Fluid Mechanics Lab at UMIST  followed by residence at Manchester Natural History Museum  and ongoing involvement in the field of ‘Bio-art’ [Including participation with Symbiotica workshop 2005, and Hackteria projects, 2009 – current] Enki [2004-2009] was along term research project investigating electric fish, harnessing their ability to communicate and navigate with electric fields, creating an artwork controlled by the live fish and their communication signals. The project was developed over 4 years through Arts Council artists fellowship with the Pepiniere programme in Paris, and Centre National de la Recherche Scientifique (CNRS) France 2006, and finally commissioned for exhibition through Arts Catalyst’s ‘Interspecies’ show Cornerhouse Manchester and A-Foundation, London 2009. Other works have transformed light into sound & amplified sound from microscopic pond creatures using lasers. He is currently investigating the ability of chemical oscillators to mimic life like processes generate patterns & sound.